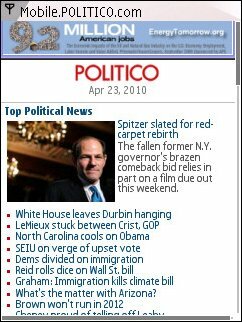 POLITICO is a three year old politics focused daily newspaper distributed for free in Washington D.C. It’s widely read by politicians, lobbyists and other D.C. insiders. The paper’s website, Politico.com has significant national readership with an Alexa US traffic ranking of 287. Politco’s mobile editions are somewhat limited. They do appear to include, with one exception, the full text and photos from all the articles and sections on the main site. The exception is Mike Allen’s daily “Playbook” column, arguably the most popular feature on Politico and thus a strange thing to leave out. Other limitations of Politico mobile are the complete absence of reader comments and the removal of all hyperlinks, both internal and external from within news stories. Politco’s stories get hundreds of comments, with the discussions often as interesting as the original articles, so why not include them, even if only in read-only format. The same goes for links, Politco’s stories are loaded with links, almost entirely internal ones to related articles and background information. I don’t understand why Politico would want to strip out links, especially internal links, which help keep readers on the site. 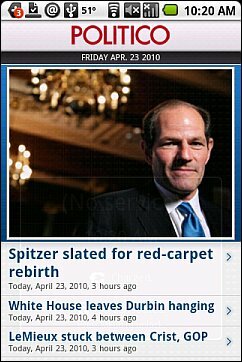 This entry was posted in News Sites and tagged politics, touch web by Dennis Bournique. Bookmark the permalink.